You can choose a pre-designed style for the blog posts. You can even apply an image in the content background. TemplateToaster presents an inbuilt stock of free images. You can select an image from the stock, or browse your custom images. Sets the typography of Product and Post Title Containers . 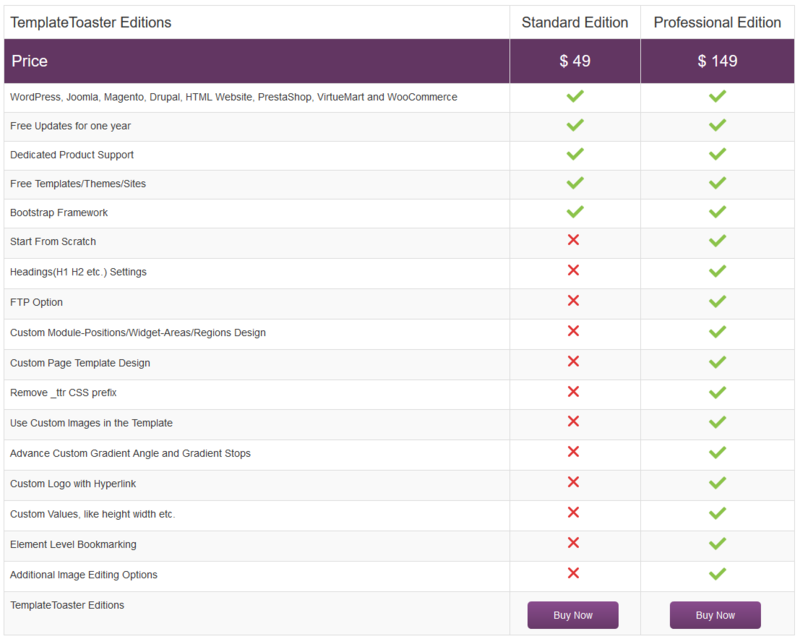 Specifies the number of product columns on a single page. Customizing TemplateToaster’s theme is so easy, even after installation. 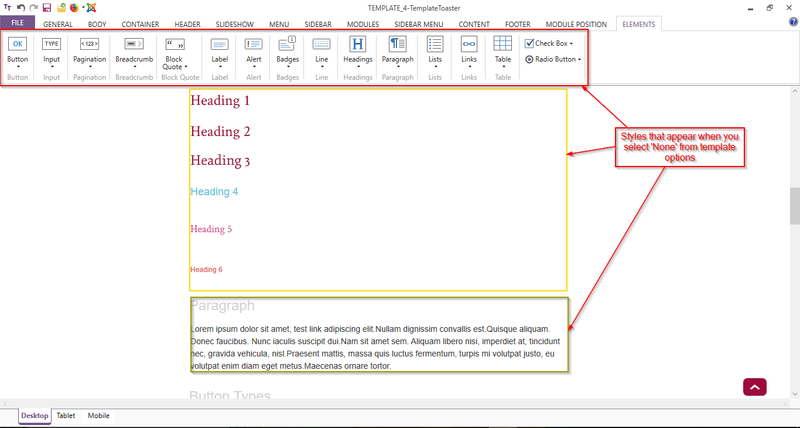 You will see an additional tool when you go in the specific template settings, under the name ” Theme Options”. These theme options give you flexibility to change some elements of your theme. Let us have a look at these theme options. This tab provides you the option for customizing the header settings. This tab contains the options for customizing the footer settings. This tab includes the options for customizing the color settings. This tab provides you the option for customizing the sidebar settings. This tab facilitatess you the options for customizing the style settings. This tab provides you the options for customizing the menu style settings. 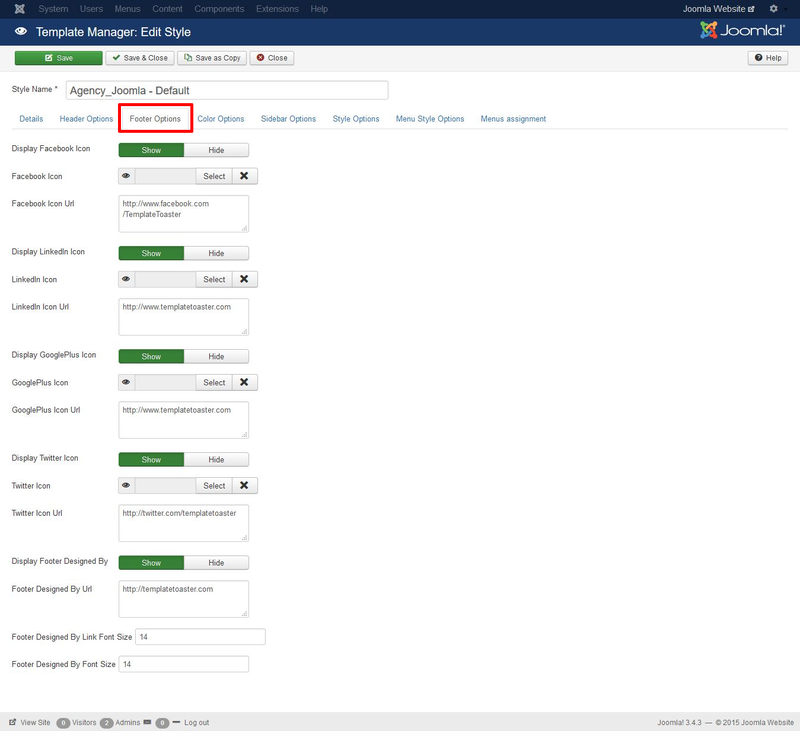 Go to Joomla backend -> Extensions -> Templates -> Edit Template -> Style Options -> select style as ‘TT default’. Go to Joomla backend -> Extensions -> Templates -> Edit Template -> Style Options -> select style as ‘None’. This tab contains the options for customizing the menu assignment settings. 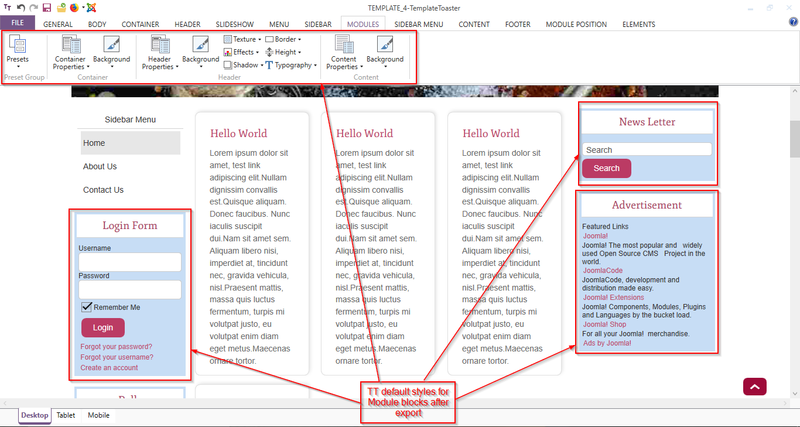 TemplateToaster is a web design software that enables a user to create fully functional templates/themes for CMSs without any technical skills. With TemplateToaster, you can design high-end WordPress themes, Drupal themes, Magento themes, Joomla templates, HTML5/CSS3 websites, PrestaShop themes, Blogger templates, WooCommerce themes, VirtueMart templates and OpenCart themes. TemplateToaster facilitates a user with new and advanced features to design more realistic and creative themes/templates and websites. You can download TemplateToaster from the download page. Use this option to provide the text on login button. Use this option to provide the text on logout button. By using this option, you can hide this widget on desired pages. You can select the pages from the list of the pages. You can select the desired style for your widget. The widget will be displayed with the TemplateToaster widget styles inside sidebar(s) & with default styles inside rest of the widget areas. The widget will be displayed with default styles on all the widget areas and sidebar(s). The widget will be displayed with the TemplateToaster widget styles on all the widget areas and sidebar(s). Using this option, you can select the appearance of your custom menu. The menu will be displayed with default styles. 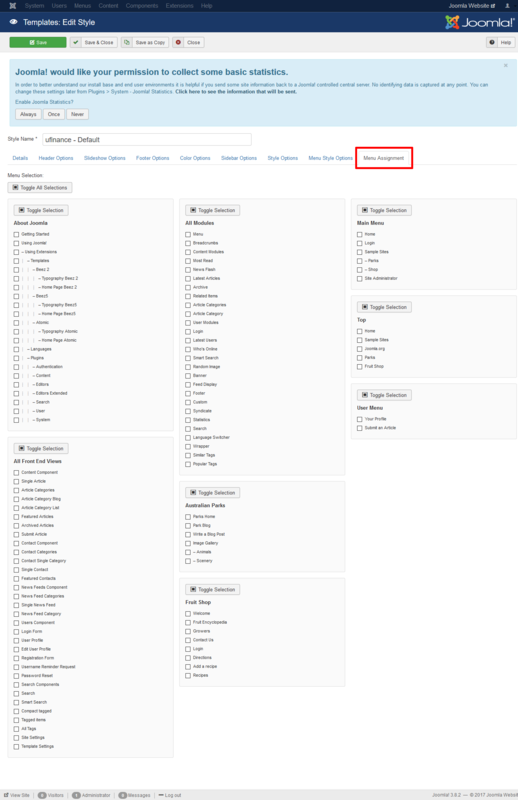 You can change the colors of Active, Hover and Normal Links of your custom menu. The menu will be displayed with TemplateToaster styles. You can choose whether you want to show the custom menu horizontally or vertically. The colors option is only available when your Menu Display is in No Style mode. Co customize the Actieve link color. It is the color of the menu link when we hover on it. It is the color of regular menu link. TemplateToaster 7 offer very high end Responsive Web Design options, we will add details of all that options on this page soon. TemplateToaster Technical Support is available here. You may post your ideas or questions on TemplateToaster Forum. – You can pay via PayPal or by Credit/Debit Card. Just click Buy Now and fill your particulars. 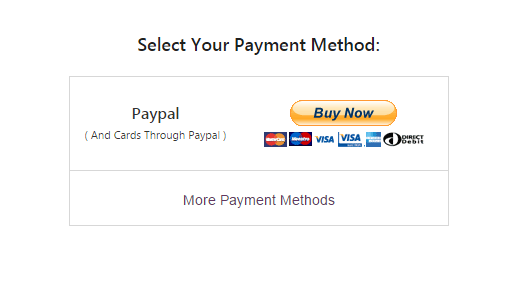 – You can choose other Payment Method by clicking on “More Payment Methods”. Once you made the payment, you will get the License Key in your email inbox. If you have any issue regarding this, you can contact our Support Team.